After a home opener on Monday, that didn’t happen for the Grizzlies, as school was canceled due to snow. The roads cleared as the day went on, but with school being closed, and roads re-freezing, the game was postponed. So, we transition to the equivalent of a get-away-day in Major League Baseball with an afternoon contest on a Wednesday afternoon. The game started at 4pm. The full coaching staff was there by 5pm (hey, it’s okay, work happens). Goffstown’s offense showed up shortly thereafter. The puck dropped and the season officially began. I heard people talking in the lobby, prior to game time, from both schools, and neither side seemed to be terribly confident in their team’s chances this season. On the other hand, the game turned out to be a come from behind, late tying goal, overtime short-handed game winner type of game. What else will happen over the next 20 or so contests? To the action, the first period started a little bit sluggishly, but that didn’t last long. Some physical play from both sides got everyone’s juices flowing and the game was on. Despite a scoreless first period, the Grizzlies from Goffstown really controlled play. Now, my critical side says that Goffstown missed the net on an awful lot of shots attempted, which would be a recurring theme. Although they did outshoot the Clippers from Portsmouth 9-3 in the opening 15 minutes. Then again, when you generate scoring chances almost every time down the ice, some will miss the mark, or many, but who’s counting. The second period heated up and it was 15 minutes of intensely contested hockey. After an elbowing penalty on Mickey Bridgeman, the Grizzlies would finally succumb and allow a power-play goal. Portsmouth’s Beau Arsenault (at 6:49 of the 2nd period) would score his first of two goals to get the Clippers on the board. The lone assist was handed to Jacob Morin. Portsmouth led 1-0, for 27 seconds. That’s when David Blodgett scored and even strength goal from Luke Squire and Dylan Stutts at 7:16 of the period. Things did calm down, and the period would end with Portsmouth holding a 2-0 lead. Shots were even at 7 apiece in the middle stanza. 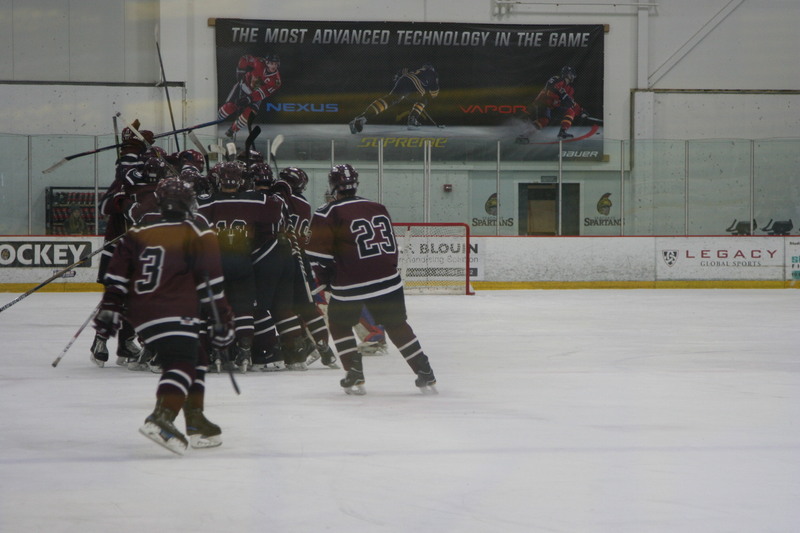 The third period was all Goffstown. The Grizzlies took just 93 seconds to get on the board, when Nick Nault (Captain) scored on a break in set up by Noah Charron. The Grizzlies tied the game at 5:58 of the 3rd period on a goal scored by Tyler Riendeau from Dylan Hyers. Just 80 seconds later, the visitors from Goffstown were suddenly in the lead. Brett Branscum scored a nice goal right at the goal mouth, set up by Max Lajeunesse and Tyler Riendeau. Portsmouth called a timeout. Then with less than four and a half minutes to play, Beau Arsenault scored again, this time from Andrew Wochs. Tie game, 3-3. Sebastian Beal and Max Lajeunesse would get a clean two-on-nothing break away with less than a minute to play, but Clipper goaltender, Lance Lavoie would make a nice left pad save along the ice, and cover up, before Lajeunesse could get to a rebound. The fans all throughout wondered where the pass was on a clean two-man break, but a left pad shot with teammate to his right, was not a terrible play. The goaltender Lavoie was just up to the task. Regulation time would end with the teams tied at 3-3. Goffstown dominated the period shot totals by a 15 to 6 margin. As the final horn of the 3rd period sounded while a loose puck was sliding along the corner boards, a scrum broke out. The officials had to separate players from both sides, and things were just a bit uncertain for a moment or two. After the whistle, Goffstown’s Mickey Bridgeman was whistled for a 5-minute major penalty for hitting from behind, and was disqualified. As the officials sorted matters out, the teams prepared to play an 8 minute, sudden death overtime. Goffstown would play the first five minutes of overtime shorthanded. After a couple of decent scoring chances on their power play, Portsmouth got caught chasing the puck. 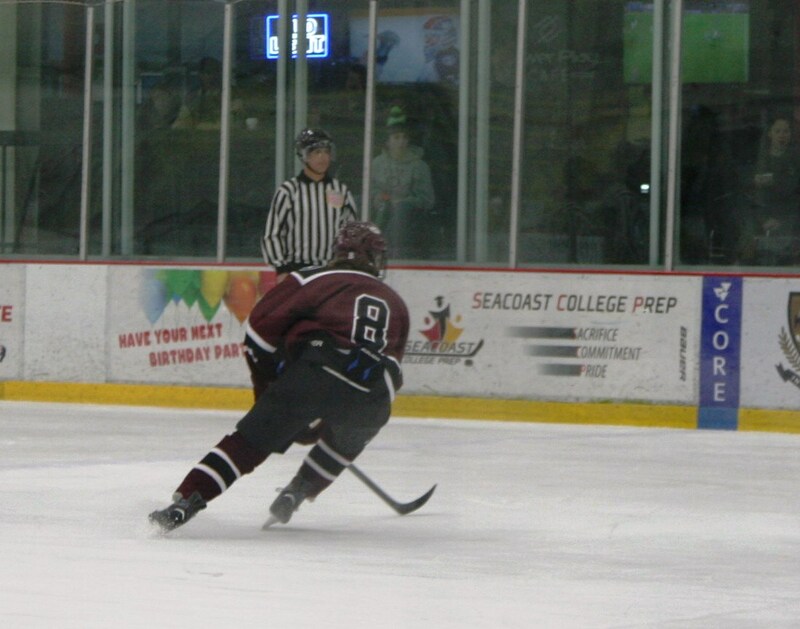 Goffstown got a good scoring chance, and the Clippers failed to clear the puck. The puck ended up on Nick Nault’s stick as he circled from outside the right circle, out high, then made a beeline for the slot area. As he did, he let a laser of a wrist shot go, and the puck changed direction off of a Portsmouth defender and into the net. Game over! Short-handed, overtime, game-winner! Welcome to your senior season Nick! And that was just game number one. Oh, it’s a great game, no matter the time of day. Goffstown scored the game winner just 2:41 into the extra session. Kyle LaSella earned the win in net for Goffstown, stopping 15 of 18 shots while playing more than 47 minutes in goal. 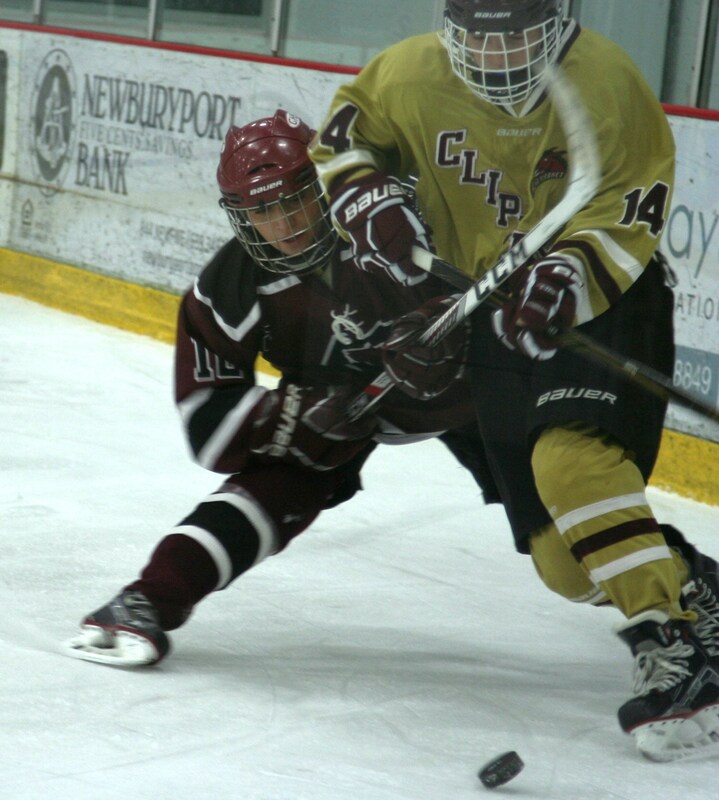 Weather-permitting, Goffstown will travel to Campion Ice Arena in West Lebanon, NH on Saturday for a 6:20pm tilt with Lebanon. Portsmouth next plays at Keene on Saturday. 2nd @6:49 PHS PPG Beau Arsenault from Jacob Morin. 2nd @7:16 PHS David Blodgett from Luke Squire and Dylan Stutts. 3rd @1:33 GHS Nick Nault (1) from Noah Charron (1). 3rd @5:58 GHS Tyler Riendeau (1) from Dylan Hyers (1). 3rd @7:18 GHS Brett Branscum (1) from Max Lajeunesse (1) and Tyler Riendeau (1). 3rd @10:38 PHS Beau Arsenault from Andrew Wochs. OT @2:41 GHS SHG (4-on-5) Nick Nault (2) unassisted. 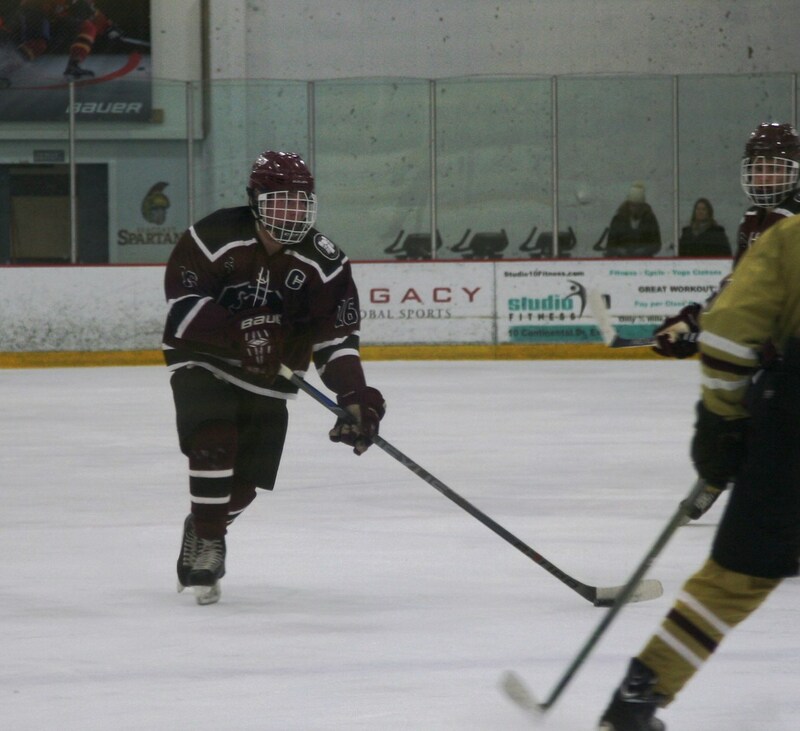 This entry was posted in Goffstown High School Hockey, Photography, Sports and tagged 1inawesomewonder, @1inawesomewondr, @GoffstownHockey, @GoffstownSports, Beal blog, blog, game-winner, GHS, GHS Hockey, GHS Hockey blog, Goffstown Grizzlies, Goffstown High School, goffstown high school hockey, Goffstown Hockey, Goffstown Strong, Grizzlies Hockey, gtown hockey, NH hockey, NHIAA Hockey, overtime, Portsmouth High School, Portsmouth hockey, Rinks at Exeter, road win, season opener, Steve Beal Sr., SWBeal. Bookmark the permalink.